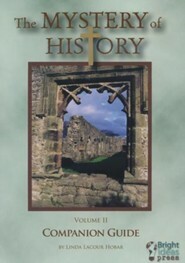 The Mystery of History Volume 2 continues the story of God's working in history with lessons that cover the early church that arose after the death of Christ (AD 33) through the Middle Ages and the invention of the printing press. 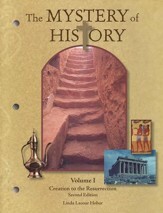 This classical curriculum is written from a Christian, young-earth, perspective, and gives students insight into how the Gospel of Jesus is the mystery behind all of history! 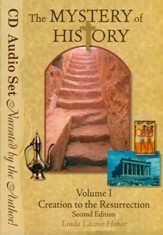 Written in a conversational style, many lessons are presented in the form of mini-biographies that integrate fascinating stories with the events of the time. Arranged by semester, quarters, weeks and lessons, each quarter begins with an "Around the World" summary of events to introduce the time period; lessons progress chronologically with each week having 3 lessons, a pretest, review, activities (including Memory Cards) and exercise or quiz. This book integrates the text with write-in activity pages; these pages are reproducible for family use or students can write directly on the worksheets. The 84 lessons will take a year to complete if you follow a traditional 36 week school year (3 lessons per week). Activities are broken down by age group and reinforce the material just learned through fun ideas that engage all learning styles; they're based upon the classical grammar/logic/rhetoric stages. Review exercises cover the timeline and map work exercises; quizzes are cumulative reviews that go over material from the very beginning of the course; the semester-long tests are similar (though longer), covering materials from 2 quarters (one major time period). Quarter-end worksheets help students synthesize what they've learned and keep everyone's memory up to date! Suggested Schedules for different age groups are included, as well as plenty of reproducibles. Line-listed answers included. 714 three-hole-punched and perforated pages. Softcover consumable worktext. Activity pages are reproducible for in-family use only. Grades 3-8, but adaptable for the family. This is still the first edition of Volume II, but currently is the 7th printing, which features minor changes such as altered dates (29 AD to 33 AD). 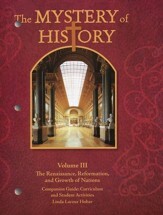 Q: Could you recommend a similar History curr. to that of the Mystery of History but more suitable for young primary students...2nd graders to be specifi Would love to find a History Pockets for the Middle Ages too. 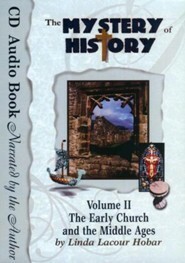 An excellent beginner curriculum covering the Middle Ages would be book 2 in the "Story of the World" series (CBD stock number WW339108), combined with the Activity Book (WW412449). 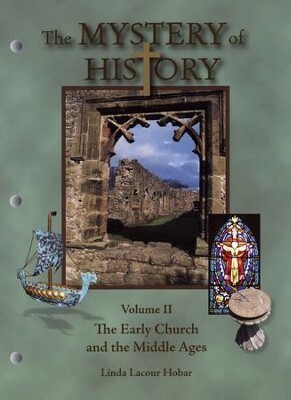 I'm the author/artist and I want to review The Mystery Of History, Volume 2: The Early Church and the Middle Ages.